For nearly a century, colour has been at the heart of Le Creuset, always striving to bring joy to kitchens around the world. A dedication to crafting superior, rich, trend inspiring colours has set the stage for continued innovation and growth in the Le Creuset colour library. This commitment to being on the pulse of colour development has led Le Creuset to introduce two fresh pastel tones to meet the growing demand from trend conscious consumers: Sage and Meringue. 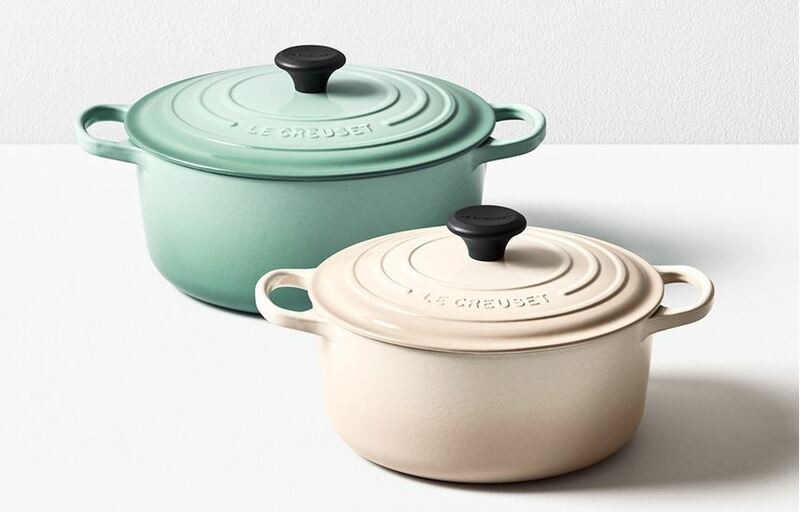 Both shades are timeless and subtle yet at the same time powerful enough to make an impactful statement on their own, together, or when paired with other Le Creuset hues. 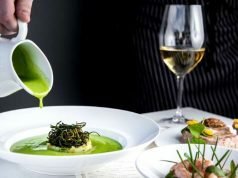 Sage and Meringue will be available in all product categories at Le Creuset boutiques across Canada as well as select fine kitchen retailers on March 1, 2019. 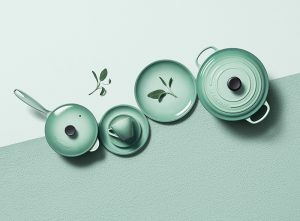 Inspired by the soft hue of the delightfully fragrant herb, Le Creuset introduces Sage, a cool and soothing addition to the Le Creuset colour family. Mimicking the look of sage leaves, the new hue is a muted green-grey colour. It looks modern and retro all at once. It is new and familiar. Trendy and timeless. Though colourful, it’s classic enough to work as a modern alternative to shades of black, white and grey. Its universally flattering tone works well with a wide variety of decorating styles – from traditional and vintage to modern and minimalist settings. Team with Bonbon, Soleil and Caribbean for a cheerful springtime colour scheme or pair with Oyster and Meringue for a contemporary look; Sage is versatile enough to pair seamlessly with any combination. Much like the European confection it’s named after, Meringue, is pure elegance. 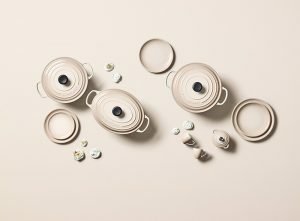 With its soft, natural cream tones, it is a new neutral for Le Creuset that feels delicate, inherently sophisticated and endlessly versatile. The organic gradient mimics the different toasted shades that can be found on a meringue to add an extra layer of dimension to every piece of cookware. Like the endlessly adaptable dessert, Meringue marries everyday functionality with elevated style to create a look that is at once refined and contemporary. Its fluidity allows it to look beautiful against the famed Le Creuset colour rainbow, warm wood features or next to modern stainless steel. Used as an accent piece or as a main colour focus, Meringue is a natural fit for kitchen settings and lends itself particularly well to tabletop items. 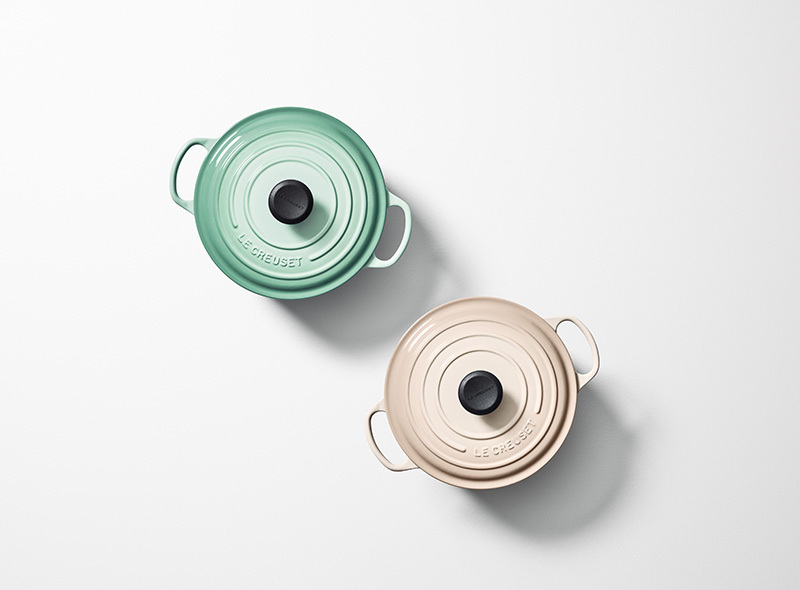 As of March 1, 2019, both Sage and Meringue will join the nine Le Creuset colours with items priced from $20 to $850. They will have a permanent spot across Le Creuset’s portfolio of quality Enamelled Cast Iron Cookware, Bakeware, Tableware and Accessories. 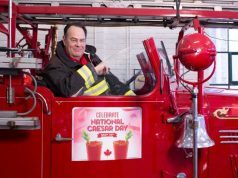 Available at Le Creuset Boutiques in Vancouver, Edmonton, Calgary, Winnipeg, Toronto, Ottawa, Montreal, Quebec City, and Halifax, as well as select fine kitchen retailers across the country.